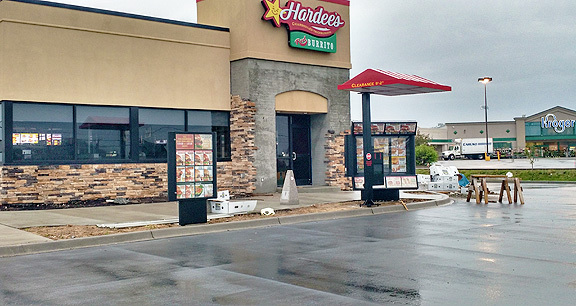 Project obstacles and solutions: The new Hardees restaurant in Lebanon, Kentucky was specified to have a concrete drive and parking lot. The architectural design called for a 4,000 psi dark gray colored concrete with a broomed finish. Craig Smith Concrete handled all of the exterior concrete flatwork and Gary White handled all other concrete work. This job posed several challenges for pouring and finishing the exterior concrete. The color needed to match architectural specifications. The pours were happening in cold weather on a job where the schedule called for three consecutive days of pouring, so set times needed to be accelerated with a admixutre that would not impact the color. Thermal crack control was also a concern. To match the color specifications, IMI supplied imix Spectra Quarry Gray colored concrete, which was mixed integrally in each truckload of concrete for even coloring throughout the batch. The integral color allowed the finishers to move quickly without the need to spend extra time applying a surface coloring agent. Special consideration in the batching process ensured that the color matched the architectural specifications. IMI QC/QA used a non-chloride, non-yellowing accelerator to speed up set times so the crews could move their forms and stakes each day. A mid-range water reducer was also added to the mix to reduce the w/c ratio to improve set times and eliminate excess bleed water. The engineering specifications called for a synthetic fiber throughout the depth of the concrete for three dimensional crack controls. IMI added micro synthetic polypropylene fibers to the mix. IMI supplied over 400 yards of imix Spectra colored concrete for this project. The outdoor flatwork and paving were all poured and finished in three days as the construction schedule called for. The cold weather did not slow the finishers. For more information about fibers to control cracking in concrete, click here.